The most important thing is that you do it! I’ve personally witnessed the power of live fruit and vegetable juices transform and heal lives. The fact that you’re here now means that your health matters and you have stumbled upon nature’s medicine cabinet. If I can help you in any way along your journey, I welcome you with open arms…. Have you ever had a stranger stop you on the street just to tell you how beautiful your skin looks? Has a fellow mom in your child’s class pulled you aside to ask you what your weight loss secret is? If you still feel like you’re living the “Before” side of your transformation story, take heart. There is a way to success that doesn’t involve counting calories, counting carbs, or grueling workouts. You can have clear skin, a flat belly, and more energy than you’ve had in decades! The secret is knowing where to start. What if you could completely change your life in only 10 days? It turns out that you can! Author Drew Canole has helped thousands of people lose weight and achieve vibrant health, and now he wants to help you, too! The 10-Day Smoothie Challenge is a comprehensive program to help you kickstart your healthy new lifestyle in a fun and supportive atmosphere. You’ll be drinking smoothies that are satisfying and jam-packed with tasty and nutritious ingredients, so you won’t be hungry or bored. With the purchase of this book, you’ll be welcomed into an active support community that will keep you accountable and even give you the chance to win great prizes like juicers and blenders. In addition, the author himself is with you every step of the way as he shares his own health transformation and personal success secrets. Find your motivation, kick bad habits to the curb, and live the life you’ve only dreamed of. With the help of The 10-Day Smoothie Challenge, you can starting living your “After” story today! 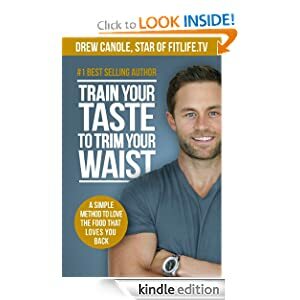 Amazon Best Selling author, Drew Canole flips this question on-its-head in this refreshingly short guide to learning how to love the food that loves you back, burn fat, lose weight, and eat healthy. If healthy food tasted better to you, you would eat more of it, causing you to look better, feel better, have more energy and lose weight. Zero rocket science involved. Drew Canole is a Nutrition and Transformation Specialist, best selling author and expert who has helped over a hundred-thousand people discover how to reshape their body and their lives. He’s here to tell you that there is a simple, step-by-step method that anyone can use to finally flip the switch to love the food that loves you back! Better yet, the method in this short but powerful guidebook has been proven, to work on almost any woman or man, no matter how hopeless or junk-food addicted they currently feel. The real reasons you probably aren’t eating right, … and why it’s really not your fault (but once you understand this, it becomes your responsibility). How a groundbreaking scientific study proves that our desire for unhealthy foods is outside of our control AND why it is sometimes so hard to eat healthy foods. The deferral-method of crave-curbing that will make this program work for you, even if others have failed in the past. How to cement your success in place using a nutrient-infusion that amplifies your craving for healthy food. You will find yourself actually craving the most nourishing foods that you know you should eat – the kind of food that gives you energy and removes unwanted weight. Training your taste buds is the key to transforming a laborious and miserable “diet” into a healthy and rewarding lifestyle that you enjoy. Everyone knows the definition of insanity: Doing the same things, but expecting different results. So, if you want to experience dramatically better results, what are you supposed to do? Drill right down to the core of who you are, and why you’re here – your why-dentity. Support yourself in becoming your best “you” with daily practices that help you connect with yourself, people around you, and also with the Infinite. What’s truly possible in your life. How you can move past the hurt of your past and embrace the present with more joy and peace than you ever imagined possible. Tools you can use to instantly quiet your mind. How you can connect with others powerfully, and from the heart. Why you never have to worry about being “enough” ever again. Drew Canole, FitlifeTV fitness celebrity and coach, started with a life marked by pain and despair, later achieved tremendous financial success and then discovered he had it all wrong. In Whydentity, Drew shares his journey to becoming peaceful, happy, purposeful, abundant, and connected – and the practices he used during his transformation. With his guidance through this book, you’ll feel like you’ve got your favorite health and mindset coach with you every step of the way. What you’re about to read and experience can change your life, helping you become healthier in mind, body, and soul. Don’t just read Why-dentity – live it. Are you exhausted from living with an autoimmune disorder and even more exhausted from looking for the answer to feeling better? Are you concerned about a loved one who seems like they are never going to be well again? According to the American Autoimmune Related Disease Association (AARDA), up to 50 million Americans suffer from some sort of autoimmune disease. In a time of incredible medical advances and education, why are so many dealing with the tragic effects of these conditions? We are here to tell you that you don’t need to suffer any longer! There is hope and there ARE answers! This book is a tool to get you started on the right track in hopes you won’t feel so overwhelmed in the process. 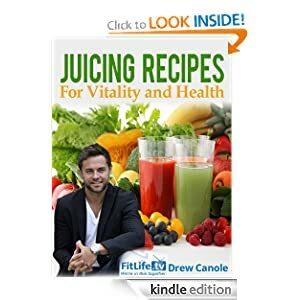 Drew Canole, the Star of Fitlife.TV and creator of the “Alpha Reset” Program, is leading a movement around the country with his passion for helping people realize the healing and health-promoting powers of live, pure, fruit and vegetable juice. Drew’s life changed the moment he was handed his first cup of live juice and he has since transformed his career and worked non-stop to help change the lives of 100,000 people. The rewards of making small shifts in your diet and lifestyle are huge. It is time to resume control of your life and live without sickness and fatigue. The life you desire is possible! Looking for warm soothing recipes to keep you and your loved ones healthy this winter? Look no more! In this simple and easy-to-follow recipe book we’ve compiled 35 of our favorite dishes to warm you up from the inside out, while also providing essential nutrients to your body. Packed with FitLife approved ingredients, free of fillers and full of lots of organic goodness, find your soon-to-be favorite Paleo and Vegan recipes. Discover the peace that comes from cooking at home and knowing exactly what ingredients you are feeding to your family. Introduce The JUICE… And Watch Their Energy, Health, Focus And Attitudes Transform! It’s no secret that kids and vegetables don’t usually get along. But there’s nothing more important to a growing body than getting the vitamins, minerals and nutrients that they need. 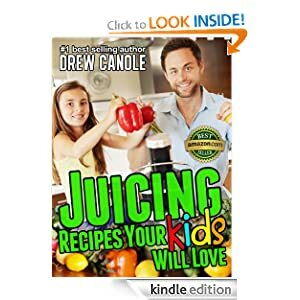 In his third bestselling book, TV host, author, juicing expert and transformation specialist, Drew Canole has revealed his secrets to getting kids to drink their vegetables and love every gulp of it. This book is designed for parents and their kids to read together, bonding while gaining and an understanding of how fun and tasty juicing can be. Packed with delicious recipes for fruit and vegetable juices, fun fruit flavored waters and even Fitlife Approved Kid Eats meals that help them (and you) get more veggies in their meals. Top 5 Ingredients you can add to Boost Your Juice! Now you can help Drew and the FitlifeTV Crew transform the lives of 10 million people by introducing the next generation to the power of the juice! What if your dreams became more than just vague memories and nightmares? Have you ever wondered what it would be like to experience a dream with total awareness? Dream hacking – or lucid dreaming – has been used for centuries as a way for people to ‘wake up’ in their dreams and become aware that they are indeed, dreaming. This awareness opens up a whole new world of self-discovery, growth, understanding and enlightenment. You do have the ability to control your dreams and use them to your benefit. Imagine what would happen if the third of your life that you spend sleeping became a practice ground, a safe haven, a retreat, a place to find answers to your most difficult questions, a playground… or anything you wanted it to be. It’s possible. One of the coolest things about lucid dreaming is that it teaches you how to lucid live. Through lucid dreaming, you will realize that you are in control, you are not just a victim and you have the capacity and potential to manifest love, strength, beauty and abundance. Once you begin doing this in your dreams, it can start happening in your life, which you deserve. If you are ready to create awareness in your sleep life, as well as your waking life, this book is for you! I’ve spent hundreds of hours researching super foods and learning how to incorporate them into my life. Ashwagandha is one that has particularly stood out to me and I want to make sure you know about it. Inside you will find information that have been proven by numerous clinical studies and research. You will find out why I and so many others are excited about this phenomenal super food!